Kubernetes offers several different authentication mechanisms or plugins. The goal of this post is to review each of them and provide a brief example of how they work. In addition, we’ll talk about the ‘kubeconfig’ file and how it’s used in association with authentication plugins. Note: In theory there’s no requirement to use any of these authentication plugins. With the proper configuration, the API server can accept requests over HTTP on any given insecure port you like. However – doing so is insecure and somewhat limiting because some features of Kubernetes rely on using authentication so it’s recommended to use one or more of the following plugins. Note: In addition, since I run the API server using the hyperkube container image, I also need to make sure that the correct volumes are mounted to this container so it can consume these certificates. This file defines 3 different authentication contexts. Context-certauth uses certificates for authentication and accesses the master through the secure URL of https://192.168.127.100:6443. Context-basicauth uses basic authentication (username/password) and accesses the master through the secure URL of https://k8stest1:6443. You likely noticed that I have two different clusters defined that both use HTTPS (cluster-ssl and cluster-sslskip). The difference between the two is solely around the certificates being used. In the case of cluster-ssl I need to use the IP address in the URL since the cert was built using the IP rather than the name. In the case of cluster-sslskip, I use the DNS name but tell the system to ignore cert warnings since I may or may not have defined certs to do a proper TLS handshake with. We can tell it’s using different contexts because it complains about not having the certs when attempting to do certificate authentication. This can be remedied by placing the certs on this machine locally. The previous example shows how to use kubeconfig with the kubectl CLI tool. However, the same kubeconfig file is also used for the Kubelet and Kube-Proxy services when defining the authentication for talking to the API server. However, in that instance it appears to only be used for defining authentication. In other words – you still need to pass the API server to the service directly through the ‘master’ or ‘api_servers’ flag. 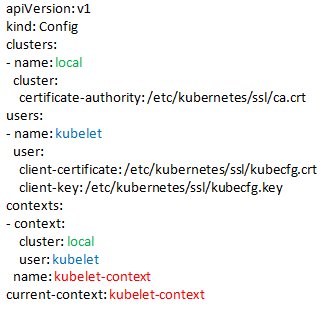 Based on my testing – you can define the server in kubeconfig on the nodes, that information is not used when the Kube-Proxy and Kubelet processes attempt to talk to the API server. 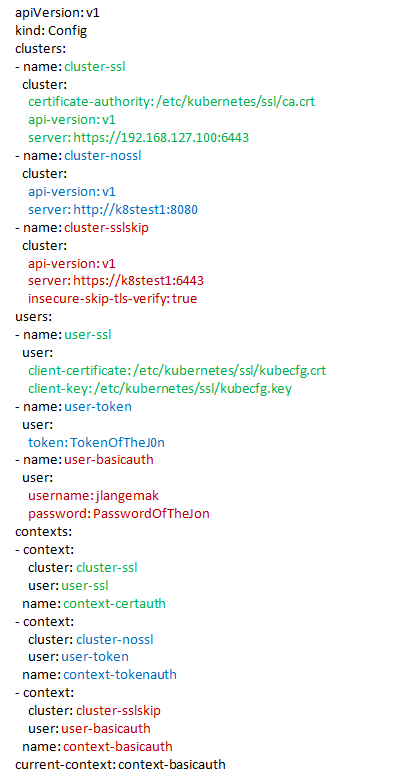 Bottom line being that the kubeconfig file is only used for defining authentication parameters for Kubernetes services. It is not used to define the API server as it is when using kubectl. My above example worked because my API server is using an insecure bind address of 0.0.0.0 which means anyone can access the API without authentication. That’s certainly not a great idea and I only have it on in my lab for testing and troubleshooting. Not passing authentication across HTTP saves you from accidentally transmitting tokens or credentials in clear text. However – you likely shouldn’t have your API server answering requests on 8080 for anything besides localhost to start with. I hope you see the value and uses of kubeconfig files. Used appropriately they can certainly make your life easier. In the next post we’ll talk more about tokens as we discuss Kubernetes secrets and service accounts. Am having issue. authenicating my new kubernetes server, version 1.11.0 from jenkins plugin. below is the error am getting? The Jenkins is running from a standalone server, and trying to connect to the kubernetes cluster.